Sing traditional carols around 9:30 pm. 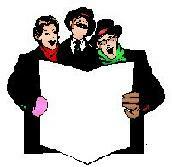 Bring a carol of your own to share. and lead us in it's singing. Enjoy plenty of fine refreshments. juice, orange and spices (no spirits). We will also have other refreshments. DWI: Should you over-indulge, please have ready, a designated driver, a trusty horse, or a sleeping roll. Kindly take a break from your holiday preparations, to drink in the ambience of the Holiday Season. "No one is a failure, who has friends." "Faith is believing, when common sense tells you to do otherwise." "All you can take with you, is that which you've given away." "Better to light one candle. 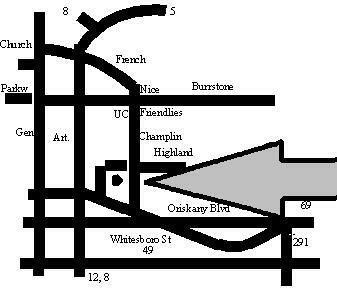 . . "
Directions: Find your way to Champlin Ave , either off Whitesboro Street, just after it crosses Oriskany Blvd, or from Burrstone Rd, near Utica College. From U. C., go North on Champlin, and take your last right onto Highland Ave, before you reach Whitesboro St. (You'll see a red brick building on the far right corner.) From Whitesboro St., Highland Ave is your first left off of Champlin Ave. Once on Highland Ave, proceed East past the two small side streets (Inman Place on the right, then Tabor Ave. on the left). Look for dark red with white trim, and two evergreens in front, and more holiday lights, then you would care to see. Parking is on the opposite side of the street from my house. From Route 12 North or South, go into the heart of Utica and 12 meets with 5 and 8, and becomes the Arterial, or General Pulaski Highway. Turn west at the Court Street intersection. (From the north this is a right hand turn, from the south you have to turn right going east, then turn around to go west.) Go west several blocks on Court, it will become Whitesboro Street at the Nice 'n Easy. Turn left onto Champlin Ave, across from Utica Converters. Take your first left onto Highland Ave. Our house is about a half a block away on the right hand side. From the West, take the thruway east to Exit 33, bear right after the toll booths to 365 East, stay on this road 9 miles until you pass Rome, and it sort of becomes Route 49. Stay on 49 another 10 miles and take the Route 291 South exit for Whitesboro. At the end of 291, turn left onto 69/Oriskany Blvd, and go west several blocks to the Whiteboro Street diagonal intersection. Turn right onto Whitesboro Street, then take your next right onto Champlin Ave, and then your next left onto Highland. Our house is about a half a block away on the right hand side. Go east on Route 5 past Sangertown on left. The road curves to the left, and becomes the arterial going north. Continue on this route (12 north, 5 east) and take the French Road Exit. Follow the ramp until it empties out to where Home Depot is. Bear right at the end of the ramp and follow French Road North. At the intersection of French Road and Burrstone (Friendly's, Nice 'n Easy & Utica College), go straight. You are now on Champlin. Stay on Champlin until the last intersection before Whitesboro St. There is a two story Red Brick building on the right. Turn right onto this Street, it is Highland Ave.
Once you have found your way to Highland Ave, proceed East past the two small side streets (Inman Place on the right, first, then Tabor Ave. on the left. My house is about the forth house on the left, from Tabor Ave. It is dark red with white trim, with two evergreens in front. Our house number is 2138. Call 315-735-8764, if you get lost. You may have to walk a bit, but it will be worth it. Wassail! We will also serve other fine beverages and snacks to "make you the longer stay", including egg nog, ale, non-alcoholic punch, cookies, crackers and cheese, nachos and salsa, and veggies and dip. You may also bring your own beverage or snack to share if you wish, but this is not necessary.